Donate now to help Elena Gosse, CEO of Australian Innovative Systems (AIS) take a stand against domestic violence. 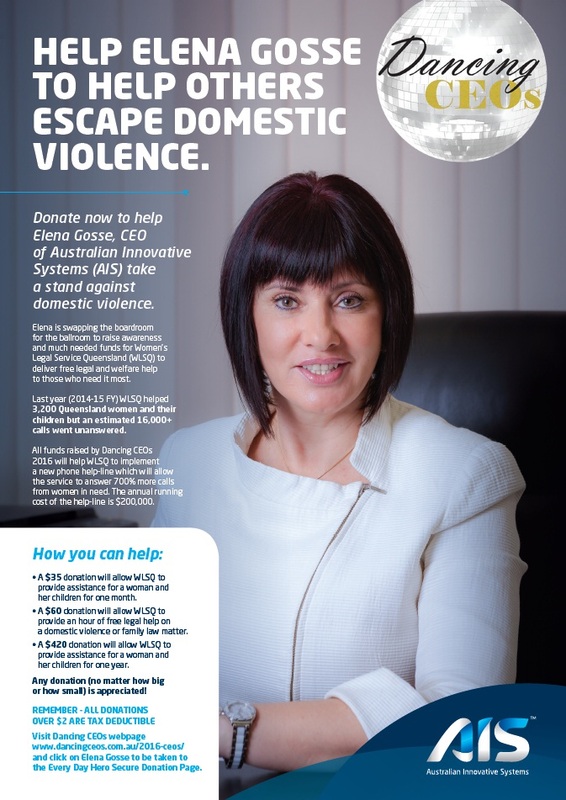 Elena is swapping the boardroom for the ballroom to raise awareness and much needed funds for Women’s Legal Service Queensland (WLSQ) to deliver free legal and welfare help to those who need it most. Last year (2014-15 FY) WLSQ helped 3,200 Queensland women and their children but an estimated 16,000+ calls went unanswered. All funds raised by Dancing CEOs 2016 will help WLSQ to implement a new phone help-line which will allow the service to answer 700% more calls from women in need. The annual running cost of the help-line is $200,000. • A $35 donation will allow WLSQ to provide assistance for a woman and her children for one month. • A $60 donation will allow WLSQ to provide an hour of free legal help on a domestic violence or family law matter. • A $420 donation will allow WLSQ to provide assistance for a woman and her children for one year. Any donation (no matter how big or how small) is appreciated! Visit Dancing CEOs webpage www.dancingceos.com.au/2016-ceos/ and click on Elena Gosse to be taken to the Every Day Hero Secure Donation Page. Download Elena’s Dancing CEOs Awareness Flyer. 2015 Ethnic Business Awards – Elena Gosse one of 12 national finalists. An initiative set up 27 years ago by Mr Joseph Assaf AM, to honour the contribution that migrants make to our community has seen Russian born, AIS CEO Elena Gosse selected as one of four, national finalists in the Medium-Large Business Category, and one of 12 overall finalists in the Ethnic Business Awards. As the world’s news centres on migrant crises, refugees and asylum seekers, these awards refreshingly celebrate the hard work, determination, enterprise, innovation and hurdles that each finalist has had to overcome in order to achieve outstanding business success in Australia. An additional award category for Indigenous Australians was added in 2010, the first national business award of its kind. After leaving behind a successful entertainment career in Russia and arriving in Australia as a single parent to two daughters (one of whom lives with a disability) Elena found herself unable to speak English and unemployed. After marrying her Australian husband Kerry, she and Kerry purchased a small, family business – a water disinfection and pool chlorine generator company – complete with three staff and a very modest annual turnover. Seeing opportunities for the business that others had not dreamed of, Elena set about learning English and furthering her education including completing multiple TAFE and University courses and acquiring a (second) degree – a Bachelor of Business with a double major in Accounting. Rising through the ranks of AIS to the top job of CEO, she fought immigration bureaucracy, cultural and gender discrimination and her own self-doubts to emerge triumphant, making AIS the multi-million dollar export business success story it is today. Elena said that being a finalist in the EBAs was a highlight in her 20+ year Australian business career. “I have always admired the contributions that other immigrants have made to this country and to be recognised as one of them is an incredibly humbling and wonderful experience, Elena said. “My parents and siblings still live in Russia and I know they will be very proud. Elena said that she would be forever grateful for the opportunities Australia provided and believes in giving back to her community as a way of expressing her gratitude. “As well as running a female mentorship program, I am a member of the Queensland Government’s Red Tape Reduction Advisory Council and a board member for Access Community Services Limited. Access is a community based, not-for-profit organisation providing settlement, employment, training and youth support services to migrants, refugees and the general community in Queensland. The EBA’s are judged by an expert panel comprising Eve Crestani – Chairman of Mercer’s Trustee Company, Allan Gyngell AO – Director-General of the Office of National Assessments and Carla Zampatti AC AM – Australia’s famous fashion pioneer. The winners will be announced at a Gala Presentation Ceremony in Adelaide on November 6, 2015 and share in cash and prizes, including $10,000 for individual category winners, from founding partner and major sponsor, National Australia Bank. The Gala Presentation will be broadcast on Saturday 14th November from 3:30pm to 5:30pm, and then again on NITV on Saturday 21st Nov from 7:30pm to 9:30pm.